Kris Jenner trying to hook daughter Kendall up with race car driver Lewis Hamilton. 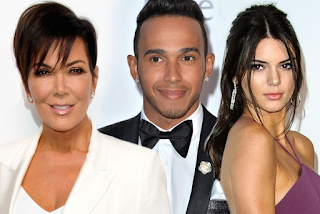 Kris Jenner reportedly thinks Lewis Hamilton is "perfect" for her daughter Kendall. The 59-year-old showbiz matriarch is said to be very keen to see the 19-year-old catwalk model - who attended the Monaco Grand Prix over the weekend - and Lewis get together. Yesterday Kendall's pal Hailey Baldwin shared a shot of a huge group of them partying, which Kris later posted herself. An insider revealed: "She really wants Kendall to date him. Lewis and Kris have become friendly in recent months and she thinks he's perfect for her daughter." Kris is apparently eager for her daughter to date the 30-year-old World Champion because he would be a "good influence", while his profile would also help boost Kendall's career. The source told The Sun newspaper: "Kendall usually goes for bad boys like Chris Brown and Justin Bieber so Lewis could be a good influence on her. "She really enjoyed being in Monaco with Lewis, who personally invited her. And of course any relationship would be a profile boost for her." Kendall is into to girls. Let see how PMK gonna pimp her lesbo daughter on yet another black man.